Fenestrations (windows, skylights, & other openings in a building etc.) allow daylight and the prevailing wind inside the building when needed. However, solar radiation that can penetrate through these fenestrations, especially windows, can lead to considerable heat gain. Glazing in windows traps the heat inside the space. Window glass allows short wave infra-red radiation from sun to pass through easily, but is very resistant to passage of long wave radiations emitted from objects inside the building that have heated from the solar radiation. Resultant temperature inside the building can thus be even greater than outside temperature if fenestration systems are not designed carefully. From NZEB design perspective, building fenestrations can affect lighting and air-conditioning loads considerably. Fenestrations also influence daylight harvesting potential by reducing lighting loads without compromising on visual and thermal comfort of building occupants. Location, sizing and glazing of windows can be used judiciously to reducing cooling load, and resultantly, smaller building cooling systems. 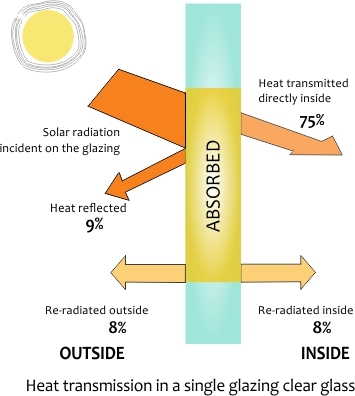 Achieving a balance between daylight penetration and heat gain requires a careful calibration between visual and heat transmission qualities of glazing, and the orientation and sizing of opening. Solar radiation intensity is minimum on north facing openings or walls both with respect to quantum and duration, followed by south facing facades. East and west facing openings (or walls) receive large amount of solar radiation throughout the year. Architects and decision makers can control heat gain and loss through prudent design of fenestrations with appropriate placement, and glazing. Glazing area should be reduced as long as it does not affect the uniformity of daylight distribution in a building. Reduce Solar Heat Gain Coefficient (SHGC) as less heat will be transferred into the building. 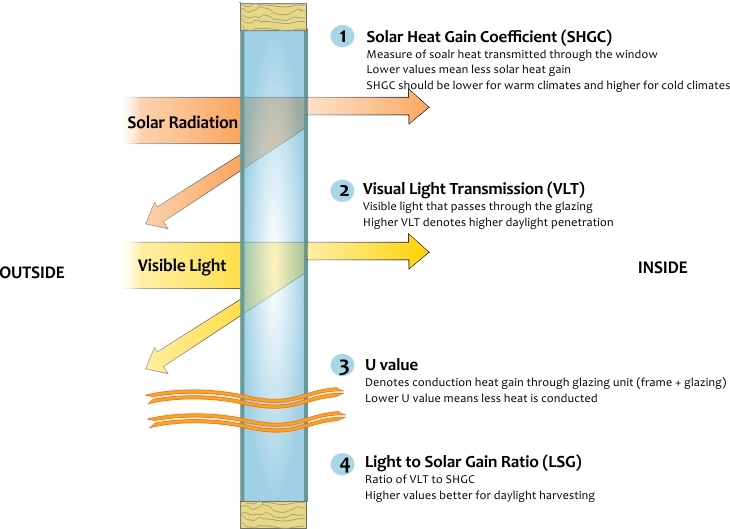 Reduce the U-Value of glazing and also lower the SHGC except for the cold climate where higher SHGC is recommended. In general cases, specify low U-values for residential applications. Even lower values may be desired in extreme heating climates. For buildings where passive solar heating energy (cold regions) is desired, south-facing windows with high SHGC values coupled with low U-factors should be recommended. When specifying windows performance, take care to specify “whole product performance values” / whole window unit for U-factor and SHGC. Use of “glass-only” U-factors should be avoided as they can be 10% to 40% better than the whole product value. In climates with significant air conditioning loads, specify windows with low SHGC values (< 0.40). In general, high (>30%) Glass Visible Transmittance is desired, especially for daylighting applications. SolarScreenSolutions “How To Prevent Heat Gain In The Home”. Autodeck Ecotect analysis is a sustainable design analysis software as a concept to detail sustainable building design tool. A fenestration system with low U-value and low effective SHGC can result in reduction of heating and cooling demand by 6-11% in moderate climate and between 8-16% in hot humid, hot dry, and composite climates. These savings increase to 8-17% for moderate, and 12-26% for hot humid, hot dry, and composite climates, if high performance fenestration system, with low-e glass, frames with thermal breaks, and well designed shading are factored in. Using double glazing reduces the internal temperature of the glass because of reduced conduction of heat from the outdoors. This results in better radiant temperature control and enhanced comfort. This effect can be felt in both heating and cooling, especially in spaces which have large glazed areas.